Search Engine Optimization or SEO training is most sought by companies to train their employees in this new field of SEO. This is first SEO training course of its kind in Mumbai and Thane for SEO training and certification which has been designed by a team of Search Engine Optimization experts. There are hundreds of jobs in popular job portals for SEO with 0 to 1 year experience and it's difficult for companies to find employees with some knowledge of SEO / Internet Marketing to fill these positions. SEO is the newest outsourcing trend for India and there are at least 300 companies specializing in SEO outsourcing only. Plus all the internet companies in India and US need a SEO team of their own. 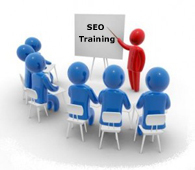 We provide professinal Search Engine Optimization SEO training in Mumbai and Thane. All our students are awarded SEO certification from our institute as well as 100% job assistance to build a successful career in the field of SEO. What to do if your site has been penalized?